Yetti I got new cable and used windows 7 on another laptop and got the ECU read. Ony code now is p1140. Hello everyone, I have a KJ Liberty 2.8 CRD which is causing me a few problems with the EGR valve. My mechanic cleaned it up two weeks ago but I'm starting to get black smoke again. I guess he didn't do a great job after all. Is there someone who could have a look? I would really appreciate that. Yes. Yeti is the guy that will help. FYI, don't be fooled, there is no tune (software) that can completely stop or eliminate an EGR valve leaking by. The only way to ensure no leakby is to blank off the EGR feed tube with a blank off plate (see drawing below) or completely remove the EGR valve and FCV system. Sasquatch Parts used to supply an elbow kit to completely remove the entire EGR system and FCV along with the EGR cooler and hoses. But unfortunately he stopped selling this item. Guess he was scared the EPA was going to get on him? But in the meantime, you can blank off the EGR feed tube with a simple blank that you can make at home out of a soup or vegetable can lid or any sheet metal of a similar thickness. All you have to do is unbolt the EGR feed tube at the EGR valve and install the blank. Then open up and remove the butterfly plate out of the FCV. There are only two small torque screws holding the butterfly plate in the FCV. 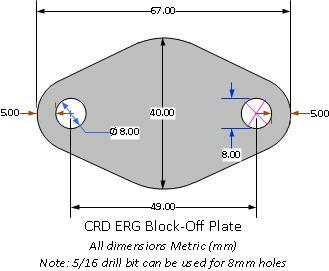 Drawing for EGR blank off plate. 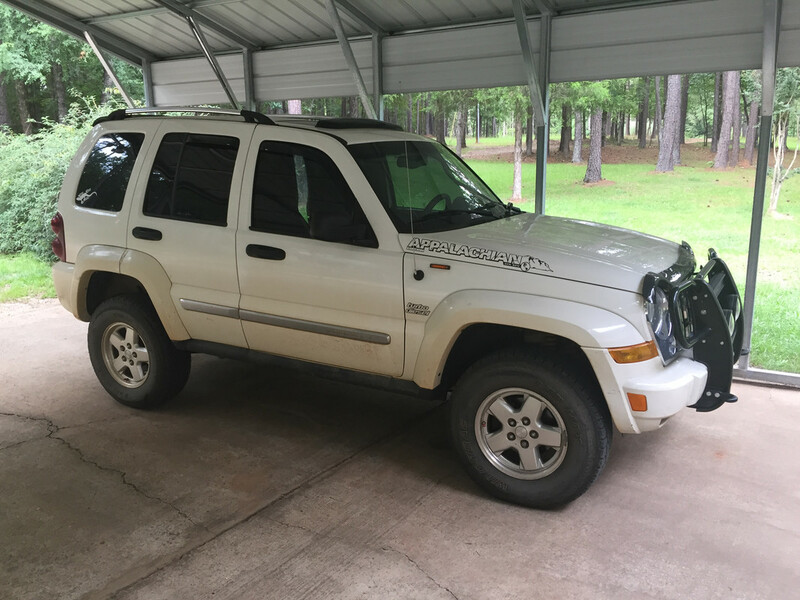 So, I'm new to Lostjeeps but not so new to Jeeps and diesels in general. Looks to me like a great culture on here and I look forward to learning what I can and contributing what I know with time. Thanks to everyone on this thread for helping out. I am currently trying to tap into my ECU on my 2006 CRD. Using MPPS (downloaded from totalcardiagnostics) and cable V13.02 I have managed to get the "ECU ID" (Chrysler File No' :1037375617), but when I try to "Read" the ECU, it says "No reply from ECU". Also, I have to run MPPS as Administrator otherwise MPPS says I have to upgrade the firmware and I get a memory error with code "0x000000000000002D"
MPPS opens fine as Administrator, but it seems like MPPS is not "waking" the ECU, although I am confused as to how it is able to get the ECU information, but not read the file. I have screen captures of the error codes that I can send out. FYI: using a Microsoft Surface Pro with Windows 10 Pro. I'm conscious of global environmental, socioeconomic and humanitarian issues: I burn Alberta diesel. Thanks guys, I’ll pm Yeti. Glad that we can buy the kit on ebay now, but what are the benefits between that kit and just the plate that WWDiesel mentioned (btw, thanks for the guide, I hope that a newbie like me will manage to install it!). Very glad to know the elbow kit is still available on line, thanks CuHunter for posting. Hope it stays available going forward for people who have not already installed one. The block off plate fully disables any soot from flowing into the intake, nothing more. Mostly used as a temporary fix until the elbow kit was installed. But if the elbow kit is no longer available, it could be used as a permanent solution. The elbow kit allows the complete removal of the entire EGR system including the EGR valve, EGR cooler, and FCV. This cleans up the engine compartment on the left or drivers side a good bit and gets rid of a bunch of coolant lines that could leak. But with the removal of the electrical components, it will require a reflash of the ECM using the MPPS software, a ODB2 cable, and one of the free tunes listed at the beginning of this thread to get rid of the DTC's created by the unplugging and deletion of these components. Certainly the elbow kit is the better of the two long term. Does this mean I have a 512 or a 032. Either way I do not see a tune for me unfortunately:(. Can anybody point me in a direction to make my own or help me with one. If not no worries I guess I will have to shell out big bucks for a real tune. This is a 2005 crd Canadian model. Thanks again! Thanks WWDiesel, your explanation is very clear. Marco replied to me regarding the tune, then i’ll buy off ebay first the flange you described and i will attempt to mount it. If that won’t be too difficult i’ll take the next step with the elbow kit. I really really want to save my beloved jeep. Thanks, this community is awesome! Thanks I’m pretty sure I’m blind because I don’t see a link for 2032. If you could possibly point me in the right direction. I used the search function and found some discussion on 2032 but don’t see any download links. I used the search function and found some discussion on 2032 but don’t see any download links. any 526 tunes to delete the codes after weeks stage one and two? Have you tried cleaning the MAF with some MAF cleaner? Available at most auto parts stores.